Why is alcohol the most widely used drug? The two biggest predictors of drug use: High availability (it’s legal) and low perception of harm. Alcohol advertising paints a picture of fun, joy, relaxation, empowerment, style, etc. Women, in particular, are being marketed to more than ever, leading to a 130% increase in alcohol-related deaths among women in the last 16 years. $5 billion is spent in alcohol advertising per year. 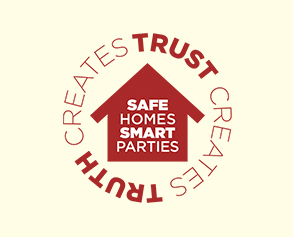 We don’t have $5 billion for counter advertising, but we do have the Safe Homes Smart Parties campaign, a way to reach parents, the biggest influencers in preventing underage drinking. We are renaming the campaign SAFE HOMES/SMART PARENTS. Who doesn’t want to be a Smart Parent? It may be unpopular in your social circle to be a Smart Parent, but is being a “cool parent” more important than keeping your kids safe? Use our tools and help us challenge incorrect perceptions about alcohol with your family and friends. Our bottle of “common sense” is a symbol for what parents should be serving their children instead of alcohol. But, common sense is influenced by environmental cues – and healthy common sense about alcohol is lacking. Help us share healthy common sense with other parents by discouraging underage drinking. This is a challenging topic. If you have questions or need guidance, we invite you to email us at info@informedfamilies.org or send a message on social media.